To understand why it is important to use organic cotton, we must expose the problems we face with conventional cotton farming. In short cotton makes up less than 3% of all the agriculture land used, but accounts for 24% of the world insecticides and 11% of the world pesticides. Over the years these chemicals have not only managed to eliminate the pests that damage cotton crops but they have killed the harmless insects and animals that feed on these pests. The circle of life does not come with a warning sign. Developing countries have adopted the conventional farming practices that have systematically destroyed people and ecosystems. Most farmers use chemicals that have been banned in other countries and carry warning labels they can not read. The big question now is whether or not cotton can be grown without having to be treated by a large amount of deadly pesticides. 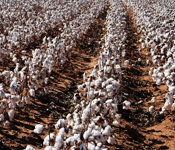 Is it possible to save the environment and still grow a healthy field of cotton? The answer to this is a resounding yes. It is what organic farming is all about. There are currently a number of farms growing organic cotton, which is not treated with the pesticides mentioned above. Initially these farms yield a smaller crop, but the environment is much safer because of them. Through crop management, better pest control and new environmentally safe pest management systems, farms are yielding crops as good or better than crops grown with pesticides. Fields must be farmed without the use of chemicals and pesticides for 3 years before they can be certified for organic cotton. The International Working Group labels these crops “organic in conversion” to help boost the ability of farms to survive before they obtain certified organic status. The truth is organic cotton farming is the only method that will eliminate the health problems, soil problems and provide the most environmentally safe fiber for the textiles we use. Recycled organic apparel will be the only product that provides a better environmental message.